Start planning now for the Day out of Time peace through culture festival (25 July) and Galactic Synchronization (26 July). This marks the climax of the 26-Year Harmonic Convergence cycle! This is a call to ACTIVATE the NEW CYCLE by creating a Global 13:20 Love Revolution based on Art, Synchronicity and Imagination! The Day out of Time is the last day of the 13 Moon/28-day calendar, a day which is no day of the week or month at all, but a day to celebrate our galactic heritage and creative unification! It is up to us to co-create the world that we would like to see. Synchronized events are the KEY to lighting up the Noosphere, the mind of the Earth! Let’s create LIVING TZOLKINs all over the planet, igniting the Rainbow Bridge! Let’s dive deep into the ocean of Time and synchronize our festivals with Global Water Blessing ceremonies on behalf of World Water Appreciation Day (25 July) put forth by Water Messenger Dr. Masaru Emoto. People who can gather 10 people, gather 10 people. People who can gather 100 people, gather 100 people. People who can gather 1,000 people, gather 1,000 people. Galactic Synchronization (26 July) is the climax of the 26-year Harmonic Convergence. 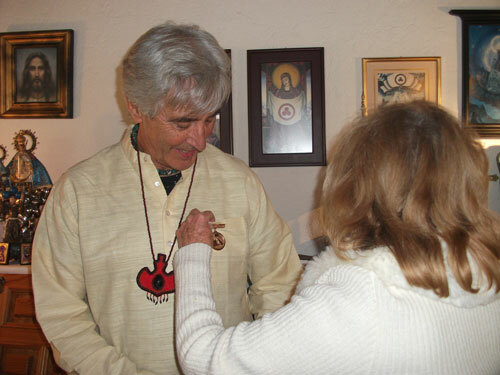 This is a call to create worldwide ceremonies for Planetary Resurrection! and the Launching of Timeship Earth 2013! Unified intention is everything. Create a prayer or ceremony in your community in reverence and gratitude to the Earth, Creator, all ancestors, prophets, sages, messengers and seers who have walked before us. Let’s Open the Rainbow Portal and become the Realization of the Highest Dream of all ancient and future civilizations – Let’s become a Living Galactic Prayer made manifest! “Resurrection indicates the elevation of consciousness from lower to higher states –especially from cosmic identification to superconsciousness, Christ consciousness.” –Yogananda. Let us harness the magick of this energy as a unified collective force and channel it into a globally synchronized celebration of Time is Art and ceremonies of Planetary Resurrection! 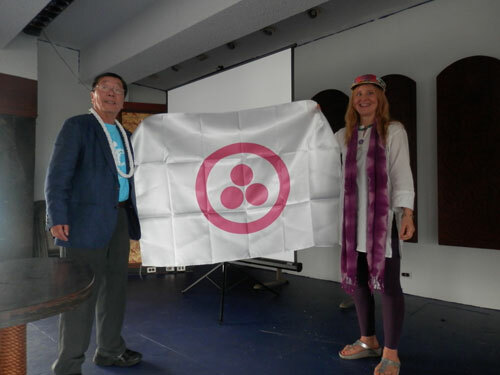 Stephanie South presents Dr. Masuro Emoto with Banner of Peace on behalf of his tireless mission as Water Messenger (and on behalf of the continuance of the work of Jose Arguelles/Valum Votan as Time Messenger). Galactic Moon 5 – White Overtone Mirror (2 March) Hilo, Hawaii. 24. Now, during this present time of interplanetary electromagnetic disorder, oceanic life, namely whales and dolphins, have been assisting in holding the Earth`s frequencies in balance. When the cycle commences and begins again, the Sun will gain a new level of evolutionary balance. Neptune 300, Frequency of oceanic memory, 300 is the triangular of 24 (1+2+3+4….+24=300) Kinich Ahau (Sun) is designated Velatropa 24. This signifies that the power of the cumulative memory of V24 is kept in Neptune, planet of oceanic consciosness. Ayoalohana Greetings! Eye am Red Planetary SerPant rotating, Electric 16, rotating thru Cosmic Dog located currently in Ashland, Oregon. Eye call myself Moi. I have two sons: One who is Blue Spectral Monkey (10yrs. old) the other is Yellow Solar Sun ( Jose’s birth y death kin combined) He was born 11 days after Jose’s crossing and 22 days after Fukshima. Eye have been following the calendar for about 8 years. Synchronicities abound!!! (: Eye write because as i understand from Rhythmic dragon you will be in Shasta for the 2013 DOOT?! To be in your presence will truly be an honor. Eye am due with child ON DOOT. Eye have dreamt this will be my daughter!!! Eye would like my Birth to be a shared with the community. Eye would like to set up a “Birthing Dome” in Shasta…maybe a month before the event and a month after. Eye have drawn up plans for a dome that is truly a sphere; an above ground dome and a below ground dome with a central spiral staircase/ and Crystal Core. The Sphere is the Earth and I would like to give her a Rainbow Bridge ring on the outside. Below surface is sleeping quarters with a a round table…emerging to the surface and above there are plants, butterflies, kitchen, fountains, koi. I would like the Kin to be able to come and go from this space and leave their Birthing Prayers and Wishes and for Us all to share this physical birthing dome. For there to be space to communicate our Visions of Crest13’s and share Birthing Pains and Lessons and Wishes and Dreams. Asha ( of Pacific Domes) has said she will give me a 16 ft. dome for $2000. There are engineers that I am close to in the area that can and have said they will help with the design for the Below ground dome. Eye feel the Vision is so close and that with a bit of assistance it will manifest. Eye want to share this seed with you–and ask if is something you would like to co-create?? My website that talks a little about it is http://www.avaterraunschool.weebly.com The site focuses a bit more on the Galaktic Avatar School then on the Birthing Dome…but it Starts with the Birthing Dome: Timeship Earth. My phone number is 541-622-4451 if it is better to talk in person. yes please have love revolution around the world.